Register to receive our customized jobs e-mail list of Linux / Open Source job opportunities that match your skill level and experience. Vist our blog for great articles on employment in the open source community. Brent Marinaccio of HotLinuxJobs now writes the Recruiting / Certification Column for LinuxWorld Magazine. Please check out his latest column. 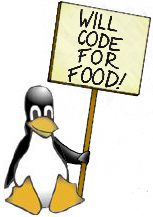 Buy "Will Code For Food" T-Shirts! Please visit our online store. Interested in Linux Certification? Check out our certification info. LinuxPlanet article "Linux HeadHunter Shop"
HotLinuxJobs appears in Marc Merlin LinuxWorldExpo San Francisco 2001 report. HotLinuxJobs appears in the AJC WebTrends section! HotLinuxJobs was listed in the WebTrends section of the Atlanta Journal Constitution. HotLinuxJobs is featured in a story on NewsForge.com about finding Linux job opportunities. LinuxPlanet Article: A New Approach to Red Hat Certification, RHCT, "HotLinuxJobs quoted in Article"